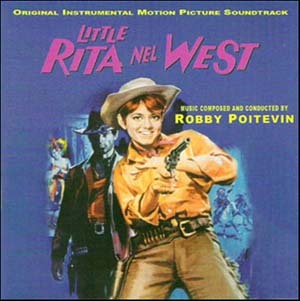 The thirtieth Soundtrack of the Week is Robby Poitevin's score for Little Rita nel West (1967, a.k.a. Rita nel West). I love spaghetti western soundtracks, and Poitevin's music for this film follows the trail blazed by Ennio Morricone. There are some other interesting musical ingredients here, though. The main theme is enough like The Shadows that you could probably sneak it onto one of their records without alarming anybody, and another recurring theme is very like Mancini, perhaps specifically drawing on "The Days of Wine and Roses".